4 Bedroom Terraced House For Sale in Fowey for Guide Price £1,250,000. A rare opportunity to purchase a four bed, 2 bath, 3 reception waterside home (including business opportunities if required) in the heart of Fowey. This unique property, with enormous scope and potential, has one of the largest riverside terraces on the estuary, enjoys direct access to the water, davits for boat/equipment lifting, a frape mooring and stunning views from all principal rooms and areas. Grade II listed, this is the first time that the freehold of the property (including the foreshore) has been offered to the open market and will be available with vacant possession upon completion. As a home and/or business or lifestyle opportunity, this property has it all. The current arrangement provides fabulous self-contained accommodation for the owners on the first and ground floors at the rear (waterside) of the property. In brief, their ground floor accommodation consists of a 36 foot open plan living area complete with lounge, mezzanine, dining area, kitchen and walk in larder. The lounge, kitchen and diner look directly onto the river through large bi-fold doors and are further supplemented outside by a large raised balcony on the same level. From the balcony, four steps descend to the decked and paved areas of the terrace. Above the open plan area, the owners enjoy a large en-suite double bed-room (accessed via 'ships' stairway from the lounge) that also looks directly onto the river whilst, below, are large cellars. The cellars currently provide huge storage areas but, subject to necessary consents, are ideally suited for development or conversion. There are two other doors in and out of the lounge and kitchen and one leads to a hallway (off of which are two further storage areas and a w/c cloakroom) and the other main ground floor areas. For the past fifteen years, one of the owners has operated a highly regarded boutique gift shop from three of these rooms (the rear one of which also has a glorious view of the river down the cobbled part of the terrace). As a bonus for those who might be considering the commercial opportunity, the property (and, hence, the shop) is double fronted onto the main high street. Furthermore, the entire property and waterside terrace are fully licensed and one of the owners allows shop users to consume drinks by the river during shop hours. For these purposes, the terrace is accessed via a door at the end of the aforementioned hallway. There are many options available to a purchaser as the shop space could be re-configured if required or revert to accommodation (e.g. three reception rooms or a home office and two reception rooms or a small retail outlet and one or two reception rooms). If reversion to accommodation was the option (which would be very straight-forward), the size and space of the ground floor accommodation would be very generous. For a Fowey riverside property, the terraced areas are huge and include an historic cobbled walkway (wonderfully awash with potted plants and trees) which leads to the main paved and decked areas at the waters edge. At present, this most delightful of terraces is available for customers at Reeds of Fowey to enjoy the views whilst sipping wines, teas or coffees. Outside of shop hours, this unique terrace reverts to a truly stunning and private garden by the sea for its owners to enjoy. It has, however, as much scope and potential as the rest of the property. Off of the previously mentioned hallway, a further hallway leads to the main stairs. These stairs ascend to a first floor landing which looks directly onto the river (the owners accommodation can also be accessed via these stairs when the holiday let is not in use). From the landing, there is an additional bath/shower room, toilet and three further bedrooms. At present, one of the owners utilises these areas/rooms as a self-contained holiday let, complete with its own kitchen. However, the upstairs could easily revert to a two bathroom four bedroom configuration (indeed, two of these rooms could also become en-suites). Alternatively, the business element could be retained or the let would be ideal for visiting friends or a dependent relative. The options to re-configure are many and would provide stunning riverside accommodation for a large family. Alternatively, the property lends itself to part or full commercial use. Of course, a couple seeking a lifestyle change have the perfect opportunity to live, work and play on the river. As regards playing, the current owners take regular advantage of being able to step over their back wall and directly into their boat for trips up the river to Lerryn, Golant, Pont, Polruan and Lostwithiel (the latter being a 14 mile round trip for a beer and fish 'n' chips). When the weather is good, the auxiliary engine is lowered onto its mount via the davit and the owners head out to sea and the beaches at Pridmouth, Polkerris and Lantic Bay. Fowey is regarded as one of the most attractive waterside communities in the county. Particularly well known as a popular sailing centre, the town has two thriving sailing clubs, a famous annual Regatta and excellent facilities for the keen yachtsman. For a small town, Fowey provides a good range of shops and businesses catering for most day-to-day needs. The immediate area is surrounded by many miles of delightful coast and countryside much of which is in the ownership of the National Trust. 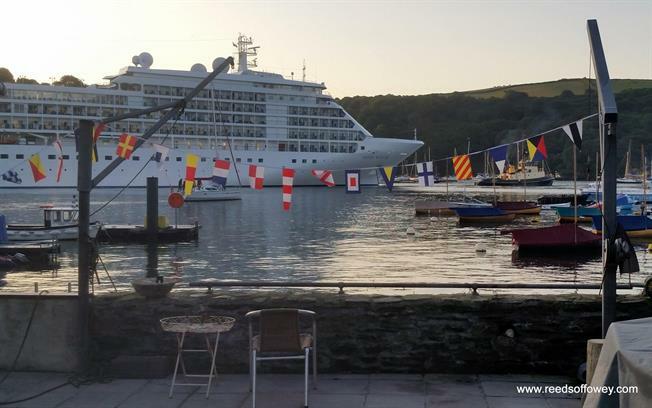 Award-winning restaurants, small boutique hotels, excellent public houses etc have helped to establish Fowey as a popular, high quality, destination. There are several excellent golf courses within easy reach, many world-class gardens are to be found in the immediate area and the fascinating Eden Project with its futuristic biomes is just 5 miles to the north west. There are good road links to the motorway system via the A38/A30. Railway links to London Paddington can be made locally at Par and St. Austell, and there are flights to London from Newquay. The following services are available; mains gasm mains water and mains drainage. Telephone line and broadband are connected however as agents we have not verified connection.